'Wonder' is sweeping the nation! 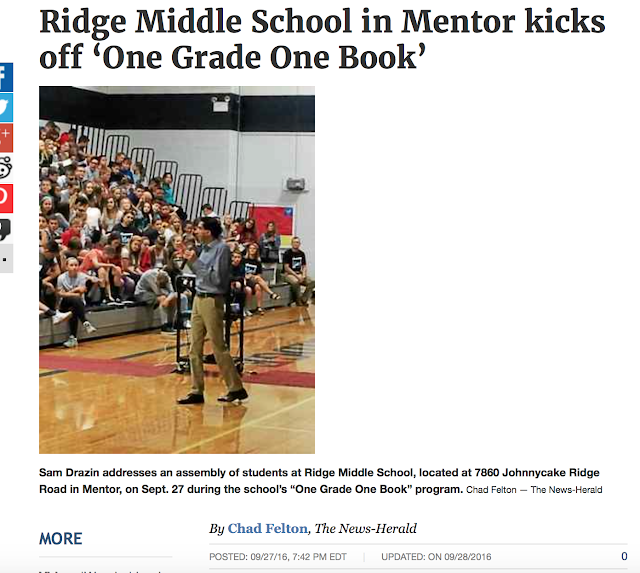 The latest group of students to read this book attend Ridge Middle School in Mentor, Ohio. Many schools are utilizing this book to teach acceptance, kindness, and how to deal with bullying. The original article appeared in The News-Herald. A portion of the text is reposted for you below. When Sam Drazin was 5, he had what was to be the first of seven reconstructive surgeries — five on his outer ears, and later one each on his jaw and nose. Drazin, invited as a speaker for the school’s first “One Grade One Book” program, was born with Treacher Collins syndrome, a craniofacial anomaly and rare genetic condition that affects bone and tissue development. As a result, Drazin suffered from hearing loss; he now uses a bone conduction hearing aid to help him hear. The main character of “Wonder,” the book by R.J. Palacio selected for the six-week program, is Auggie, a boy who, like Drazin, has Treacher Collins syndrome. To read the rest of the article go to the News-Herald website.